I am a huge fan of popcorn and other sweet or salty snacks so when I found G.H. Cretors, I knew I wanted to try their popcorn. I was sent a bag of each popcorn including caramel, cheese corn, kettle corn and caramel nut crunch. The first one that I opened was the caramel nut crunch popcorn. It has whole almonds and whole cashews in it which is good for some healthy fat and protein. One-half-cup serving has 130 calories, 6 grams of fat and 16 grams of sugar. This is a lot compared to light butter popcorn but as a sweet treat on occasion would definitely be worth it. The popcorn has a hard crunchy outer layer from the caramel and once you bite into it, melts in your mouth. I love the nuts along with the popcorn. I brought this to a Detroit Tigers baseball game with my husband and we both loved it. The Just the Cheese Corn was also delicious. I love cheese popcorn and this did not disappoint. The pieces were larger than many popcorns which I liked. It was salty and cheesy and made the perfect snack for watching a movie. Check out G.H. 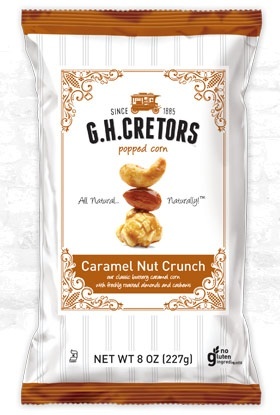 Cretors popcorn for a tasty treat! Disclosure: I was sent this popcorn for free to try. I was not compensated. All opinions are my own.